When testing an hypothesis with a categorical explanatory variable and a quantitative response variable, the tool normally used in statistics is Analysis of Variances, also called ANOVA. In this post I am performing an ANOVA test using the R programming language, to a dataset of breast cancer new cases across continents. The objective of the ANOVA test is to analyse if there is a (statistically) significant difference in breast cancer, between different continents. In other words, I am interested to see whether new episodes of breast cancer are more likely to take place in some regions rather than others. Beyond analysing this specific breast cancer dataset, I hope with this post to create a short tutorial about ANOVA and how to do simple linear models in R.
Sometimes ago I took a statistics course and this was actually part of the assignment; I hope there won't be major errors in the methodology I am going to follow, and of course any feedback/critique will be very welcome. My dataset has breast cancer data for 173 countries as it was originally collected by ARC (International Agency for Research on Cancer) in 2002. The dataset also includes several other socio-economic variables about countries, though I am not gonna explore them in this occasion. To obtain the final dataset, I conducted some minor cleaning and added the "continent" variable, through a merge operation. To see how I've done this, you can also check a previous post about merging datasets with R.
If you like to get the final dataset, you can download it here in .csv format. Once imported into R, I stored it into a variable called "gapCleaned". (* the blue boxplot with missing label, refers to North America). 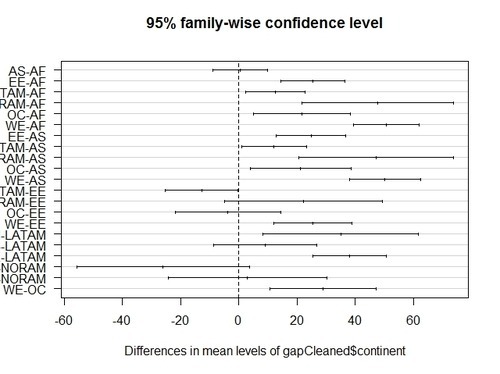 The boxplot shows that means are different (some less, others more). 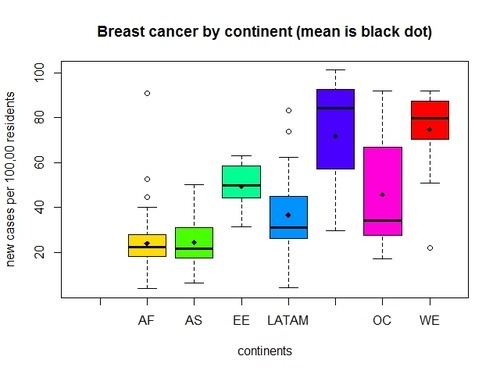 But it also shows that each continent present a different amount of variation/spread in breast cancer, so that there is much overlap of values between some continents (e.g. Africa&Asia or North America & West Europe). Hence, differences in means could have come about by chance (and we shouldn’t reject the null hypothesis case). That is where ANOVA comes to help us. The question we are answering with ANOVA is: are the variations between the continents means due to true differences about the populations means or just due to sampling variability? 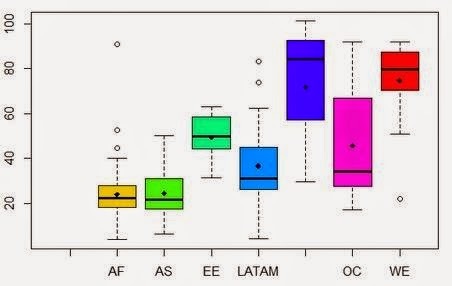 To answer this question, ANOVA calculates a parameter called F statistics, which compares the variation among sample means (among different continents in our case) to the variation within groups (within continents). Through the F statistics we can see if the variation among sample means dominates over the variation within groups, or not. In the first case we will have strong evidence against the null hypothesis (means are all equals), while in the second case we would have little evidence against the null hypothesis. Good, my F value is 40.28, and p-value is very low too. In other words, the variation of breast cancer means among different continents (numerator) is much larger than the variation of breast cancer within each continents, and our p-value is less than 0.05 (as suggested by normal scientific standard). 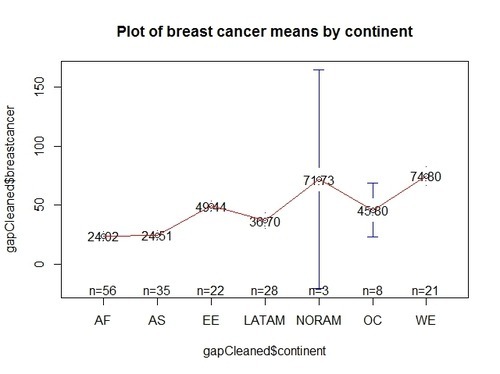 Hence we can conclude that for our confidence interval we accept the alternative hypothesis H1 that there is a significant relationship between continents and breast cancer. What I know at this point (thanks to ANOVA), is that NOT ALL THE MEANS ARE EQUAL. However my categorical variable “continents” has more than two levels (actually it has 7), and it might be that it’s just one continent that is not equal to the others. ANOVA doesn’t tell me which groups (continents) are different from the others. In this sense we will have to see each pair of continents to appreciate significant differences. there is no significant difference in breast cancer new cases between Asia and Africa ( p =0.99 > 0.05), as well as between West Europe and North America (p=0.99) or Oceania and Latin America (p=0.72), etc. Finally, I can also visualize continent pairs and analyse significant differences by plotting the the “tuk” object in R (sorry the y axis is not displayed properly). Significant differences are the ones which not cross the zero value. life expectancy: age at diagnosis is another variable to take into consideration, since life expectancy is far lower in less developed countries like Africa and Asia. Age is an important component in breast cancer causes (women over 50 are more likely to get breast cancer), and it might be that because of higher life expectancy, most developed countries present more cases than less developed ones. While it is impossible with such a "poor" model to draw concrete results from my data analysis, I guess we should take this post as a "learning exercise" that shows the main steps for performing an ANOVA test with R, and the logic behind it. I hope you found it helpful and please add your own considerations, critiques, comments below. Clearer than the tutorials I have gotten in class.